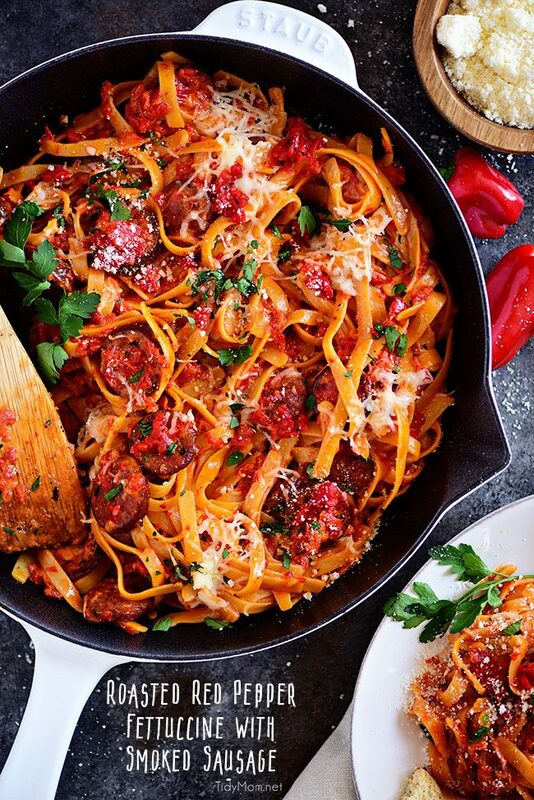 Delicious Roasted Red Pepper Fettuccine with Garlic Smoked Sausage is a sure way to win any pasta lovers heart! This dish is full of flavor and on the table in 20 minutes or less! A dinner the whole family will love! Be sure to sign up for my email… to get new recipes and ideas in your inbox! 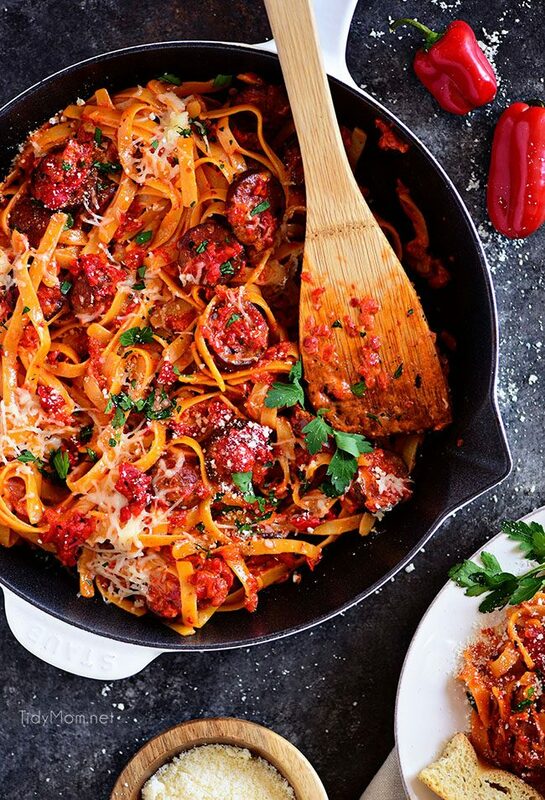 This pasta dish is seriously a lazy cooks DREAM! 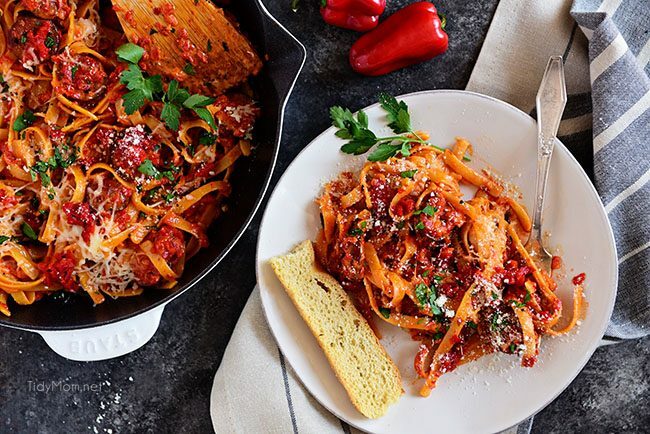 It comes together so fast and effortlessly, and who doesn’t need a super quick, pasta dish that’s full of flavor – right?! It’s sure to be a new favorite for everyone. This recipe came about after I sampled some roasted garlic smoked sausage at Costco. They must have sold a ton of it that day because the checker commented how good it must be because everyone was buying it. I first cut up a few links and browned them to serve with scrambled eggs……SO GOOD!! That’s when I knew I had to use it with pasta, and the perfect time to try a roasted red pepper sauce I had heard about!! Don’t wait to make this recipe!! 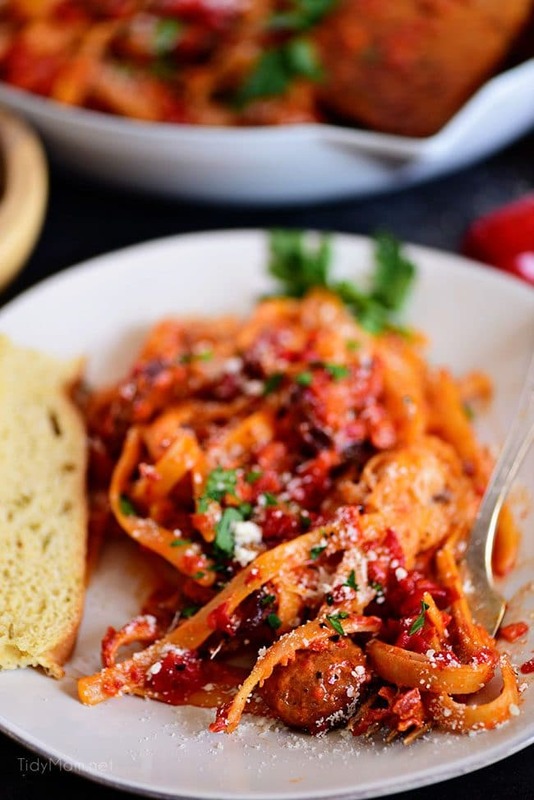 While White Bean Chicken Chili, Flank Steak Sliders and Three Cheese Baked Mostaccioli remain in my all-time favorite recipes, this Roasted Red Pepper Fettuccine with Garlic Smoked Sausage is definitely a front-runner. It not only gets extra points for how fast it’s on the table, but it’s also restaurant quality dish you can totally serve company!! Serve with a loaf of garlic cheese bread, Pasta House Co. Copycat Salad, and Tiramisu Cookie Cups for dessert! 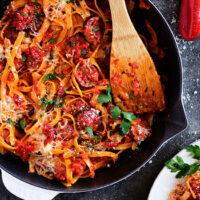 Like this Roasted Red Pepper Fettuccine with Smoked Sausage Recipe? Pin It! I created a fun little group on facebook and I’d love for you to join in! 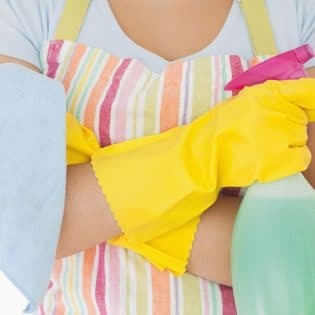 It’s a place where you can share YOUR favorite recipes, home tips, creative ideas and ask questions and see what’s new with TidyMom! If you’d like to check it out, you can request to join HERE. Be sure to follow me on Instagram and tag #tidymom so I can see all the wonderful TidyMom recipes YOU make and tips YOU use! Bring a large pot of heavily salted water to a boil and cook fettuccine to al dente, according to package directions. Drain, rinse and set aside. Meanwhile, in a large skillet brown the sliced smoked sausage over medium-high heat for about 5-6 minutes. Drain grease. Add entire jar of roasted peppers (including liquid in jar) to a mini food processor/chopper or blender. Blend until smooth. 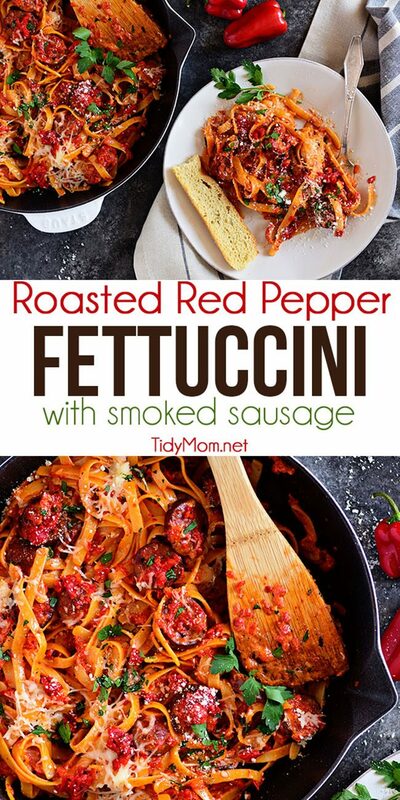 Pour the roasted red pepper puree into skillet with smoked sausage, stir over medium heat until heated through. Slowly add heavy cream, stir to combine and continue heating about 10 minutes or until sauce begins to thicken. Add drained pasta, Parmesan cheese, and parsley to skillet and gently toss to coat. if you don't use roasted garlic smoked sausage, add 1-2 teaspoons of minced garlic when browning meat. Making this recipe? Share it with us on Instagram using the hashtag #TidyMom so we can see what you're creating in the kitchen! Would you adopt me please?? Thank you for this amazing looking recipe! 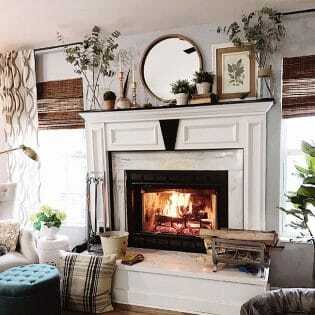 I cannot wait to make it! We all need a lazy recipe on a weeknight and this looks amazing! This dish looks so mouthwatering delicious. Thanks for sharing. Can this be made ahead and reheated in the oven for a picnic.? This was absolutely delicious. We doubled the recipe and I added some oregano and Italian seasoning, salt and pepper. My husband who won’t touch a red pepper was “wowing” throughout the meal!! Winner! !